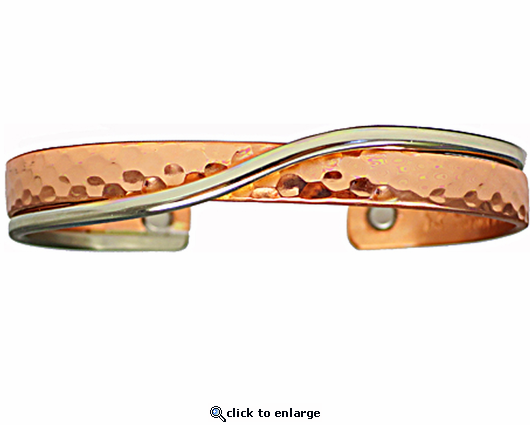 This is a copper magnetic therapy bracelet which Sergio calls Hugging Metals. A playful design that is made of a generally cold German Silver Strand that is warmly hugging a hammered copper band. It is Sergio Lub style 819. In this medium size, it is about 6" and would fit wrist sizes about 6" - 7". It has 2 rare earth magnets, no plating is used, and it is made in USA. I have bought your products before and love them as I do this bracelet.